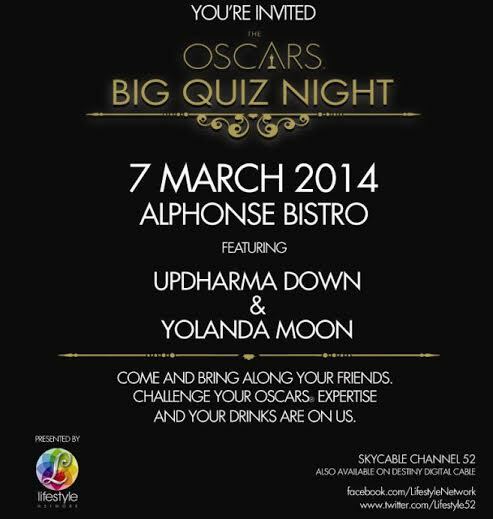 In celebration of the recently concluded biggest night in movies, Lifestyle Network will be holding a special treat for its viewers and movie buffs with the Oscars Big Quiz Night, happening in three legs this March. At a time when Bar Quiz Nights are the country’s hottest trends, the Lifestyle Network will be paying a visit to Manila’s top Gastropubs to host the three-leg event, where anyone and everyone with an interest or passion for film can join in on the fun of the Academy Awards. The events will be taking place at 8:00pm. 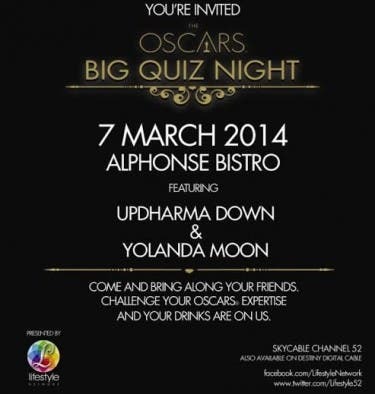 The first leg, which will also feature performances by Up Dharma Down and Yolanda Moon will be happening on March 7 at the Alphonse Bistro, City Golf Plaza, Pasig City. The second leg will be on March 14 at Prohibition/Dillingers 1903, Greenbelt 3, Makati City; and the last leg of the Big Quiz Night will be at Aracama, 2/F, Bonifacio Global City, Taguig. A group of three to five members may register at the entrance to join the Quiz Nights. They simply need to register at the door of any of these venues atleast an hour before the games begin. The games will consist of two rounds namely elimination and finals round. The questions will come from these categories: Silver Screen, Red Carpet, and Surround Sound. The team to get the most number of correct answers will be declared the winners and will receive special Oscar gift sets and cash prizes. For updates, visit and like the Lifestyle Network’s official Facebook page (www.facebook.com/LifestyleNetwork).